Recirculation systems involve the addition of varying amounts of dilution water in order to improve the removal of manure from the animal area. The two types of recirculation systems used in pork production facilities are underslat flushing and pit recharge systems. Both systems use a shallow gutter that is flushed or drained periodically to remove waste from the building to the lagoon or storage basin. Open gutter systems have been used in the past but are no longer recommended because of concerns with disease transmission. A flush system operates by using a surge of water to flush manure from the gutter. Water is periodically released into the gutter, usually with a flush tank (Figure 1). The amount of flush water and the flush frequency are designed to provide enough water to ‘scour’ manure from the gutter. Large volume pumps are sometimes used to provide flush water instead of flush tanks and smaller pumps. Spent flush water and manure enter the lagoon where it is treated and later reused for flushing. In areas where irrigation is practiced, fresh water may be used for flushing instead of recycled water and the flushed wastewater can be stored for later land application. 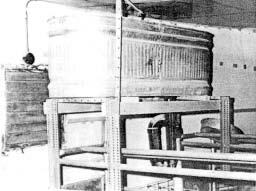 Pit recharge involves the periodic (three days to three weeks) draining of the pit contents by gravity to a lagoon/ basin, then recharging the pit with about 12 inches of new liquid in a short time, usually less than four hours. Regular pit draining removes much of the manure solids that would otherwise settle and remain in the bottom of the pit. Liquification of settled solids increases their likelihood of removal at the next pit draining. With less organic matter available for bacterial digestion, there is less gas production in the dilute pit contents, and a better in-house environment. In addition, fewer odorous gases are exhausted from the pits to the surrounding building vicinity. Regular and frequent loadings of manure also enhance lagoon performance. In farrowing and nursery buildings, pits typically are drained and refilled between groups. During winter months, cleanup water may be used as refill water to minimize radiant heat loss from the small pigs to cold recycled lagoon or basin water. Recirculation systems have the greatest appeal to operators who wish to store manure outside the building and to those with suitable locations for lagoon or earthen basin construction, since the additional dilution water requires an earthen storage in order to economically handle the larger volume of manure. Assuming that the hog operation can accommodate a recirculation system, what are its advantages and disadvantages? Reduces in-house gases and odors. Frequent removal of the manure significantly reduces the characteristic ‘clinging’ odor inside the building and improves air quality. A three year study in North Carolina demonstrated that pit recharge systems have lower ammonia levels than either underslat flush or deep pit systems. Adapts to building conversion. Older buildings are more easily converted to shallow recirculation gutters than deep pits since less construction is required. Greater nutrient loss. Lagoon-treated animal manure has a greater nutrient loss than manure stored under a slotted floor. Requires a relatively large land area for a lagoon. A lagoon takes four to six times more land area than the building itself. Subject to mechanical problems. A recirculation system has mechanical components such as flush tanks and pumps that are subject to breakdown. Lagoons/basins are a potential odor source if not designed and operated properly. They are not suitable in some locations, due to prolonged cold weather or proximity to neighboring residences. Flushing may increase humidity in cold weather. A pipe from the main recharge line is installed into each pit, preferably as far as possible from the drain outlet. However, the location of this recharge pipe is not critical since liquid addition to the pit is the objective rather than a high velocity scouring action for flushing. The inlet pipe can be either stubbed directly into the pit wall with a conveniently located and protected butterfly valve outside the building, or it can enter the building wall near ceiling level and drop down to the pit with an inside-thebuilding valve. The diameter should not be reduced between mainline and pipe discharge. The recharge system can be managed successfully with a flat pit floor, although a minimum slope of 1 inch in 20 feet to the drain is recommended to overcome uneven concrete construction. Enough pit depth must exist to cover the upper end of the pit floor with at least 6 inches of liquid while leaving at least 12 inches between the slats and the liquid at the highest part of the pit floor. At least one-third of the floor area should be slotted. Manure removal from a flushed underslat gutter depends on the velocity, depth, duration, and frequency of the flush. These factors are determined by the dimensions and slope of the gutter and by the rate flush water is added to the gutter. To adequately clean the gutter, a flush velocity of at least 2.5ft per second is needed. A minimum of a 2.5in. depth of flow with at least a 10-second flush is recommended. For channels longer than 150ft or with flushing devices which have a longer flush duration, such as siphons, increase the flush volume proportionally to provide the needed cleaning action. A rule of thumb is to increase the initial depth of flow by 50%, or 0.5in. for each 25ft of gutter length beyond 150ft. The flush device determines the initial depth of water flow. For instance, a 3in. siphon provides water for only about a 1in. depth of flow in a 24in. wide gutter, whereas larger siphons provide greater depths and can flush wider gutters. Since 3in. and 4in. diameter siphons release water in about 30 seconds, flush volume must be increased to compensate for the lower flowrate. A ‘tipping bucket’ flush tank can deliver a 3in. depth of flow in almost any width gutter with a 5-10 second release, while the door opening and volume of a ‘trap door’ tank can be designed to provide almost any depth of flow and flush duration. Consider depth of flow in selecting the gutter slope. Table 1 presents the recommended slopes for flushed gutters with various initial flow depths. To achieve the same cleaning action with less gutter slope, a greater depth of flow is required. Slightly crown (1/4in.) the gutter floor and give a smooth finish. Gutters wider than 4ft should be subdivided into widths of 1.5-2 ft except for the first 10-20ft to allow the flush water to evenly distribute across the gutter width. This keeps water from channeling around waste deposits as it moves down the gutter. Inverted concrete hog slats or 6in. vinyl strips or 1×6 P.T. plank embedded in the floor work well for this purpose (Figure 2). For gutters longer than 200ft, consider draining both ends toward the middle of the building, and consult a knowledgeable building engineer for assistance. Wherever possible, use gravity to carry waste to the lagoon or manure storage basin. Generally, a sewer line 8in. in diameter with a 0.5% slope is sufficient to carry manure to the lagoon. For flush tanks larger than 1000gal or where the same sewer line must handle several flush tanks, contact a knowledgeable engineer to determine if a larger sewer line or additional slope is needed. 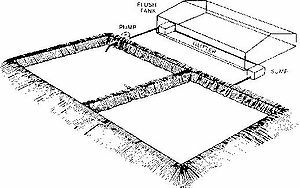 Locate a sump pit to collect discharged (or runoff) flushed wastewater. The drain line to the lagoon should be designed to prevent manure gases from the storage and drafts from entering the animal area. The required frequency of flushing is determined by two factors: animal density and the solids-carrying capacity of the water. The minimum flushing frequency can be determined by dividing the total daily flush volume (Table 2) by the recommended flush volume (determined by channel geometry in Table 3). Typical flush frequencies are twice a day for farrowing, nursery, and gestation buildings to four times a day for finishing buildings. When underslat gutters are flushed manually, the volume per flush is determined by simply dividing the flush volume per day by the number of flushes per day. Odors from underslat floors can be lessened by flushing at least four times a day, although pit ventilation in addition to frequent flushing is needed for best control of ammonia odors. To insure cleaner pens in partially slotted buildings, keep hog density at about 4ft2 per 100lb of animalweight, use solid partitions except at the gutter area to help establish the desired dunging patterns, and adjust the ventilation system to keep the slat area colder than the resting area. Producers may need to floor-feed pigs during their first week in the building to help establish good dunging habits on partially slotted floors. A 1.5in. stepdown to the slats from the solid area also helps establish desired dunging habits. Several types of flush devices have been developed to provide the required flush volumes: automatic siphon tanks, tipping buckets, trap door tanks, manual dump tanks, and large volume pumps. Automatic siphon tank: This tank has the singular advantage of no moving parts (Figure 3). As the tank slowly fills with water, an air bubble trapped under the bell is forced out a siphon pipe until it triggers the siphoning action. An automatic siphon tank can be placed above the pens to reduce tank floor space requirements. Commercially available 8-24in. diameter automatic siphons can handle very large volumes of water. These flush units typically use a 1-1/2in. airrelease pipe to trigger the large siphon. Large siphons are well suited to flushing underslat gutters. Tipping tank: A tipping tank dumps when it fills to a depth where the center of gravity of the water volume over-balances the pivot point. Usually the tank is elevated 4-6ft off the floor and the water is dumped backwards onto a curved spillway. This increases the velocity and lowers the head of water so it will clear a 9-10-inch opening between the bottom of the first slat and the surface of the gutter. Because the water discharges all at once, flushing velocity and depth are high and can cover a gutter 8-10ft wide (Figure 4). Gutters flushed with a tipping tank should be 12 inches deep or more to minimize water splash into the first pen. Trap door tank: This flush tank has more moving parts than either of the above but allows greater design flexibility because both tank volume and trap door can be modified to meet individual needs. Care and precision are necessary to get a watertight seal around the door. 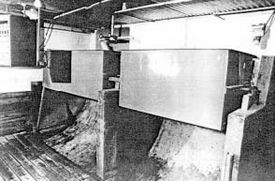 An automated version of the trap-door or hinged-gate valved tank gives the flexibility of more frequent flushings when the operator is not present. The valve consists of a float-controlled flat plate that sets against a section of the PVC pipe in the tank bottom. Large volume pumps: Large volume pumps can be used for flushing if sized to provide at least 100gpm per ft of gutter width, about 1-1/2in. water depth. The pump should operate 4-5min per flush channel at least two times a day for adequate flushing. Since additional cleaning is possible by operating the pump for a longer period, depth of flow does not need to be as great as with flush tank and flow dividers become more important to make sure distribution of water front is accomplished in wide gutters. A properly designed and operated lagoon is essential to the success of a flushing system (Figure 5). Although a single stage lagoon can operate satisfactorily in an underslat flushing system, a two-stage lagoon is preferred to minimize odor and potential disease transmission. The design criteria for lagoons used with recirculation systems are the same as for conventional swine manure lagoons. See PIH-62, “Lagoon Systems for Swine Waste Treatment,” or MWPS-18, “Livestock Waste Facilities,” available from Midwest Plan Service, for design information on lagoons in your area. In recirculation systems, pumps or gravity transport effluent from the lagoon to the building. In some cases, pumps are also needed at the low end of the gutter to transport wastewater to the lagoon. In pit recharge, a low-pressure, self-priming centrifugal or submersible pump with enough flow capacity to recharge the largest building pit with an average of 12 inches of liquid in 4 hours or less is normally recommended. The pump intake is generally an open-ended suction pipe floating approximately 18 inches beneath the liquid surface of the lagoon. It may be screened with a 1 inch wire mesh fence or a basket with a total opening that is at least five times the opening area to the suction pipe. Slow speed pumps (1725rpm or less) cost more initially but usually last longer than higher speed pumps (3450rpm). Because of their shorter service life, it is a good idea to keep a replacement recharge pump on hand. Minimize the use of metal parts in contact with recycled lagoon water to prevent salt deposition that can plug the line. 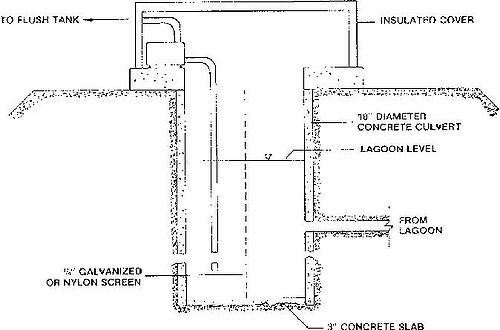 A lagoon-to-building pump can be placed on the lagoon bank in an insulated enclosure or in a wet-well sunk in the bank (Figures 6 and 7). The pump must be protected from freezing weather. The intake pipe from the lagoon to the wet-well should be at least 18 in. below the lagoon surface, several feet from the bank and as far away as practical from the point where the waste enters the lagoon. Locate the pump as close as practical to the high water level of the lagoon (preferably below the low water level using a flooded suction) to minimize pump priming problems. The pipe must be installed within the berm during lagoon design and construction using anti-seep collars and proper engineering design. If a pump is needed to lift effluent from the building to lagoon, it should be a commercial grade, sewage lift-type activated with a float switch. Pump capacity should be determined in relation to the size of the sump that collects the spent wastewater to adequately handle the highest flow rate resulting from the flush tank discharges. Pump intake should have an adequate cleanable screen area. The pipe from the lagoon pump to the gutter can be relatively inexpensive plastic pipe and, if possible, should be one continuous piece. See Table 5 to determine the size you will need. Note the earlier warning about installing the pipe through the berm. If water is recycled from the treatment lagoon, salt buildup in pumps and pipes is a common problem. Avoid sharp turns in the supply pipe because they add to pressure drop and create turbulence conducive to salt precipitation. Regular addition of dilution water to the lagoon and removal of salts by irrigation will reduce problems. In most areas of the U.S., add a volume of dilution water that is equal to the volume of waste added. Use fresh water, lot runoff, roof runoff, or other sources for dilution water. Dilute acetic or hydrochloric (muriatic) acids can be used to dissolve salt deposits. Muriatic acid can be bought in paint and hardware stores and is usually available at 20% solution. Plastic pipe can be dosed with undiluted 20% muriatic acid solution by filling the piping system with this acid, letting it stand overnight and then flushing the acid solution through the system. If possible, field spread this acidic high salt material at a very low rate, rather than back to the lagoon. If the flush system has metallic parts such as pump housing or metal valves, the acid should be diluted (1 part acid to 12 parts water) to prevent damage to the metal. CAUTION: DO NOT ADD WATER TO CONCENTRATED ACID! WHEN MAKING THE DILUTION- ALWAYS ADD THE CONCENTRATED ACID TO WATER. Use care and wear protective equipment because mixing acid can be very dangerous! Ground the electric pump-housing to prevent an electrostatic charge from building up on the metallic pump by attaching a cable to the pump-housing and to a ground rod driven into damp soil. The pump suction line must be large enough to prevent cavitation (excess turbulence, resulting in a sharp pressure drop and increased salt deposition). A rule of thumb is that the suction line should be one standard size larger than the discharge of the pump. Locate the pump below or as close to the lagoon water level as possible to minimize the suction lift. If the pump does not run continuously, modify the system so the pipes can drain between use. The pipe from the lagoon to the gutter should have a minimum diameter of 1-1/2 in. The problems are not as great in larger lines as they are in smaller ones. (See Table 5). 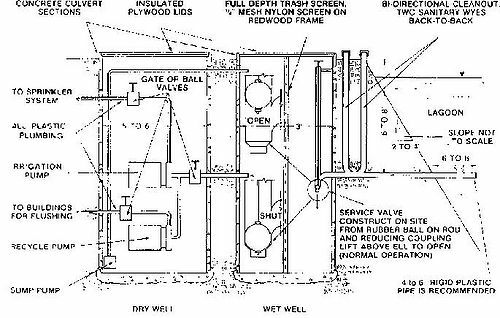 Consider oversizing the supply pump and piping system, operating it on a timer, and allowing the system to drain when not in use. While more expensive to purchase, contact time between the pump and pipes and the lagoon water can be greatly minimized in this manner. Table 1. Recommended slope for flushed gutters. Table 2. Minimum required volume of flush water/day. Table 3. 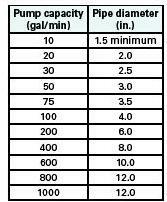 Minimum gallons of water required to flush gutters at various depths of flow (5-10 second release). Table 4. Tank discharge rates required to flush gutters at various depths of flow. 4. Determine size of return pipe (lagoon to flush tanks). * a) Select from table 5 using flow rate for pump selected in step 3. 2 in. Consider a larger pump and piping system and operating with a timer and float to minimize contact with corrosive lagoon water and salt deposition. A good rule of thumb is to operate the pump no more than 2 hours/day total. Figure 1. Perspective showing the components of a flush gutter system. Figure 2. Cross section of an underslat flushed gutter with dividers. Figure 3. An elevated automatic siphon tank being used in a farrowing house. Figure 4. Tipping bucket tank used for flushing underslat gutters. Figure 5. Cut-and-fill construction for two-stage swine waste lagoon system. Figure 6. Diagram of a wet-well configuration. Figure 7. Pumping for a lagoon using a wet-wall and dry-wall configuration.